My latest obsession. 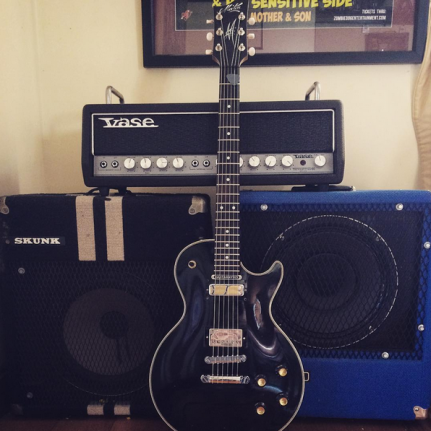 Solid state goodness made here in Brisbane. Through guitarnerd I’ve gotten to meet some amazing people who help create the tools us guitarnerds need to do what we do. 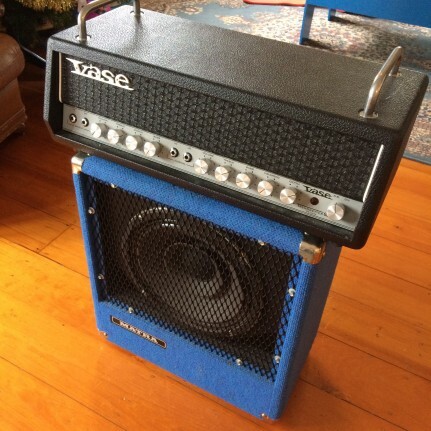 Through a fellow Maton nerd, Greg T, I was introduced to Harry & Carol from Vase who are the nicest people ever and who happen to be behind the resurrection of the iconic 60′s amp, the Vase Trendsetter which I made now a proud owner of. While I was at the factory a few years ago to check out Harry’s Yamaha collection, Harry pulled out a familiar looking carpet covered combo. I’d thought I’d seen a few being used by Brisbane bands through the years but i never really took much notice of them. 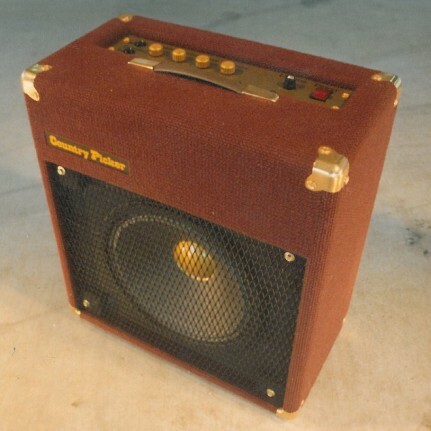 I was surprised to learn that Harry built them in the 70′s and they were made in Brisbane. I was even more surprised when I plugged it in. 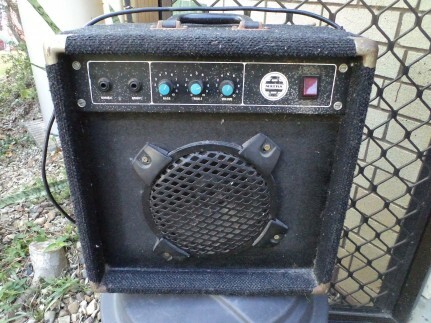 It had an almost Marshall JCM800 sound… perfect crunch with great bottom end and plenty loud. 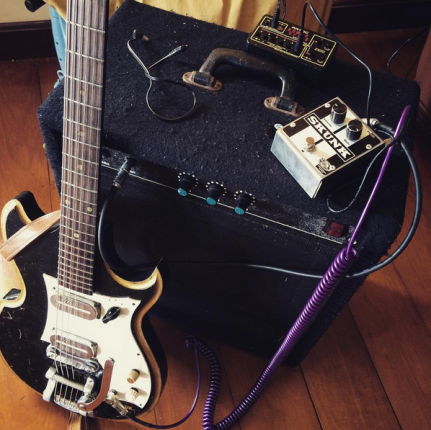 Here’s a recording I made with a Skunk and Harry’s Yamaha SG. Harry said only 100 or so were made… which meant I was instantly hooked. Rare and made in Brisbane? I needed one! 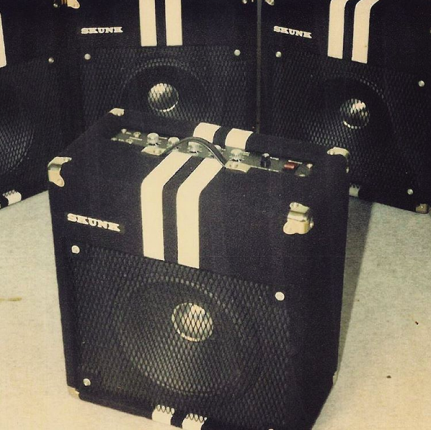 I’m not sure if it’s the deep shape of the cabinet but they have great bottom end and are just fantastic sounding cabs. 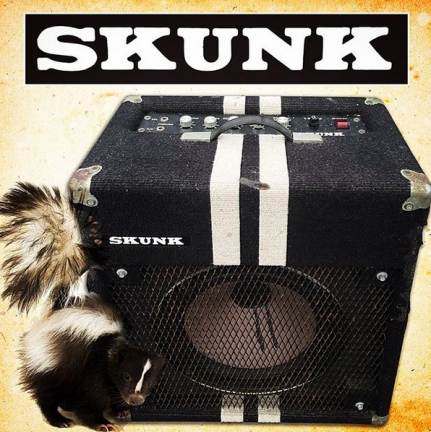 I had took a leaf from the Hot Snakes and started using it in stereo with the Skunk… the Skunk acting as the JCM800 roar and the Vase Matra acting as the Vox chime. Along with sounding huge, it looked cool as hell. And totally transportable in my tiny car. The story doesn’t end there. 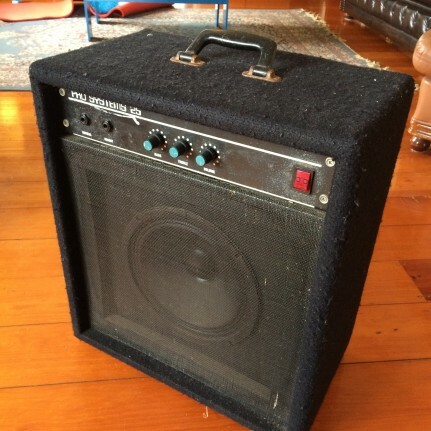 A few months ago I got an email from a friend Michael who had picked up a tiny Matra amp with an 8″ speaker. He was surprised with how great it sounded… which with the Vase circuitry isn’t a surprise. 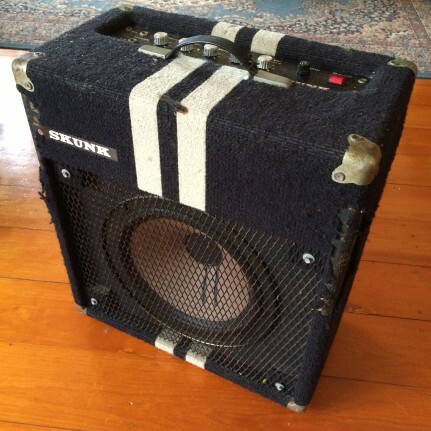 As luck would have it, a few weeks ago my friend Mark found a Pro Systems 25 with the 10″ speaker, which sounds so good. Score. 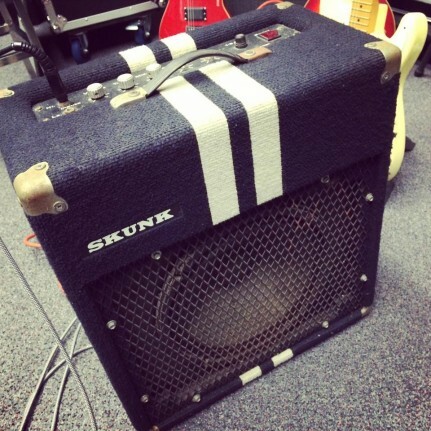 This is larger than Michael’s… with the cab being the same size as the Skunk. So I now had an awesome collection for less than the price of a decent fuzz pedal. I need a Country Picker. 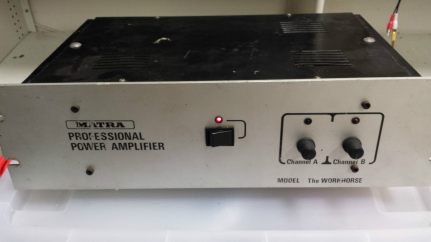 I’ve never seen one or heard one, but I’m guessing it’s like a louder version of my Pro System 25 which sounds really good. And no, the story doesn’t end there. 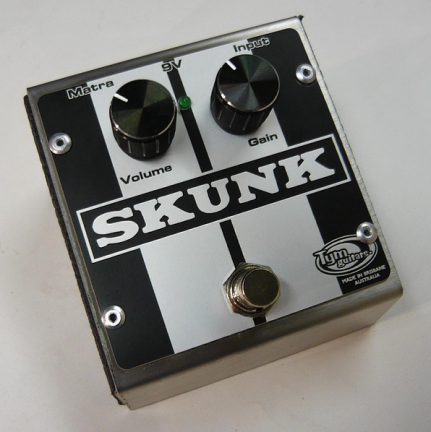 As a tribute to Harry’s great work to the Brisbane music scene, Tym Guitars and I designed and built Harry a limited edition Skunk distortion pedal. I gave it a blast into the clean Pro System 25 and it instantly turned it into a Skunk. It’s a winner. Tym Guitars & Matra… a match made in guitarnerd heaven. 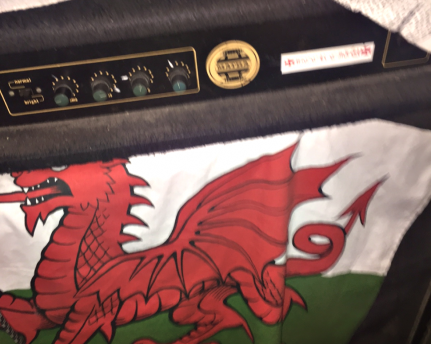 I’ve also been sent this picture of a Matra bass amp which is owned by a bandmate of a friend (excuse the blurry photo). I’m not sure what the specs of these are but I’m keen to track one down. 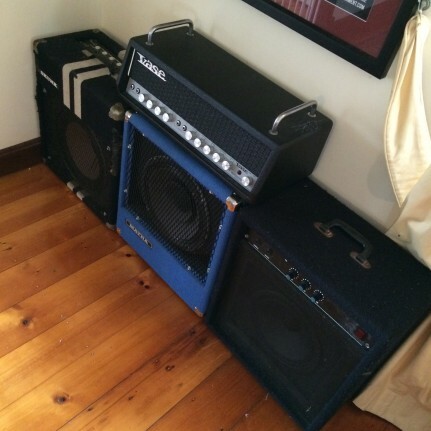 http://www.gumtree.com.au/s-ad/manly/guitars-amps/vase-bassman-120-guitar-amp/1115591490 Just come across this…You might be interested.